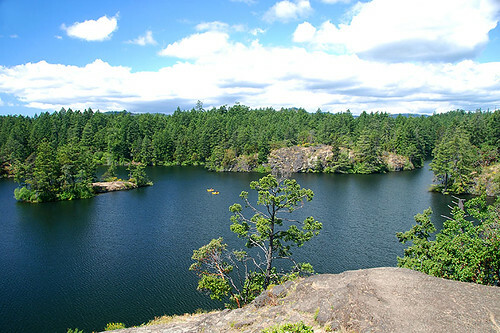 Thetis Lake Regional Park features 833 hectares of lakes, swamp, forest, and hilltops, and sandy beaches that front the park’s two heavily indented lakes. Located in View Royal on the west side of Victoria, about 12 km from the city centre, this park is popular with paddlers, hikers, naturalists, and anglers, as the lakes are stocked with catchable Rainbow Trout. In spring, the park is ablaze with a dazzling display of wildflowers. Swimming is unsupervised, as lifeguard service is not provided in regional parks in Victoria. 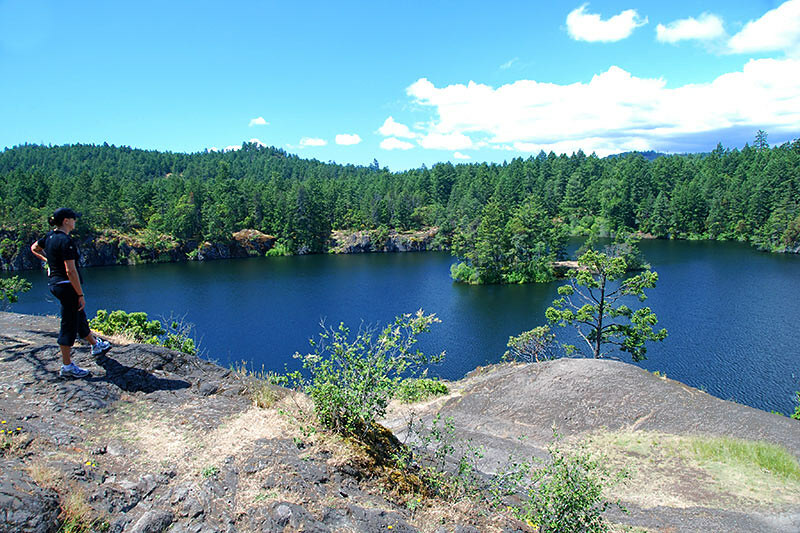 Dominating the park is Thetis Lake, which consists of Upper Thetis and Lower Thetis, connected by a narrow culvert. Paddlers may reach the more remote beaches of the lakes and can explore the many bays and small islands that are a feature of Thetis Lake. An extensive network of moderate to challenging forest trails criss-crosses the park, providing endless hiking opportunities for all level of hikers. A compass and a topographical map of the area are recommended due to the numerous unmarked trails and access roads. For panoramic views of the lakes and surrounding hills, follow the more challenging trails up Seymour or Scafe hills. 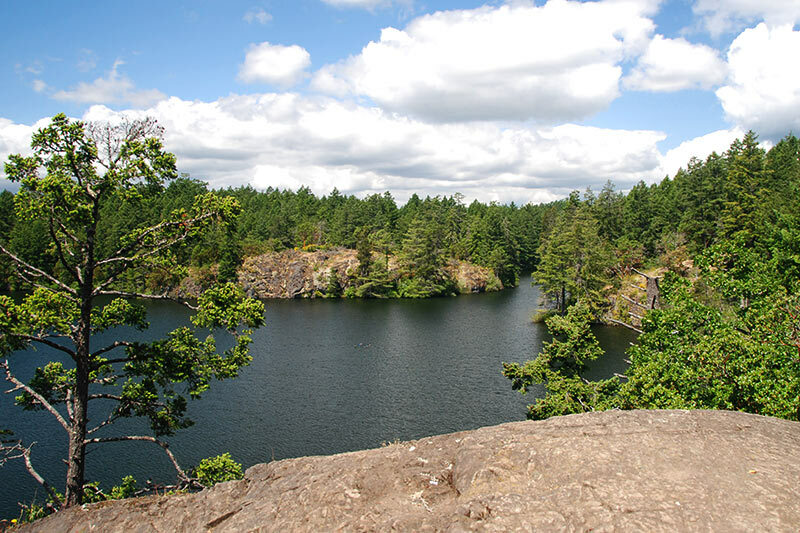 Park facilities at Thetis Lake Regional Park include parking, washrooms, picnic tables and concessions. The only motorized boats permitted on Thetis Lake are those with electric motors. Power boats are not permitted on Prior Lake. Access to Thetis Lake Regional Park is via the Colwood exit off Highway 1 (Trans-Canada Hwy), west of Victoria. Turn right onto Six Mile Road in View Royal, which leads you directly to the parking lot. Allow approximately 20 minutes driving time from Victoria. The 1.3-km Thetis–Langford Connector Trail allows Langford residents to access the park by walking, running or cycling, without travelling on busy roads or cycling on hiking trails, and connects with other cycling routes such as the Galloping Goose Regional Trail. Bus riders can take BC Transit bus #50 to the Six Mile Road stop and walk approximately 1 kilometre to the park.